An understanding of how bones respond to loads that cause failure (fractures) can help one understand the forces that cause the damage. Figure 18.1 is an injury not uncommonly seen in emergency rooms and orthopedic offices. It is not uncommon for a patient with this injury to state that it happened during a fall. However, if one asks this patient, “Who did you hit?” the patient usually looks at you sheepishly and says that he was in a fight or got angry and hit a wall. The x-ray shows what is known as a boxer’s fracture, which usually results from hitting someone or something with a closed fist. The normal reaction when falling is to open one’s hand and fall on the open hand, sustaining a wrist or elbow fracture. 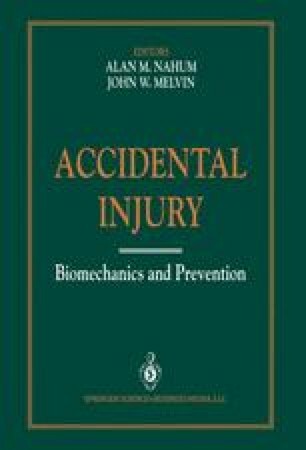 An understanding of the biomechanics of extremity injuries not infrequetly allows one to determine the trauma that caused an injury.